La Carnita, a popular chain of Mexican restaurants in Toronto, sparked a social media storm after a Trump-inspired Instagram post. 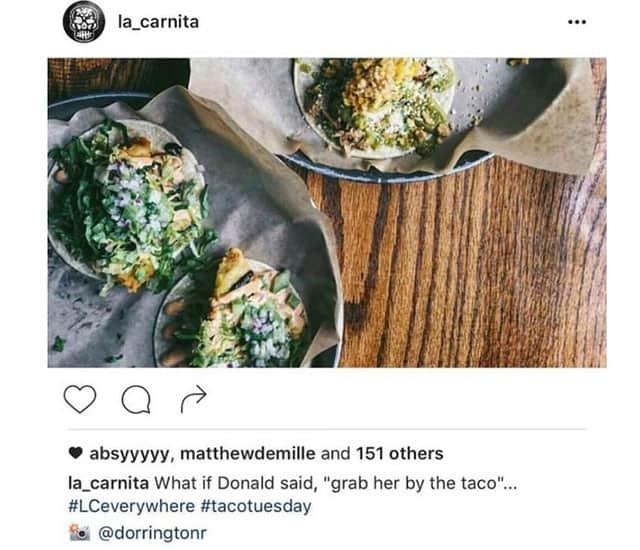 Someone at La Carnita thought it’d be a good idea to use Trump’s recently revealed lewd comments about women as a caption on a picture of tacos. It didn’t take long for the photo to get shared and for angry comments to flood the restaurant’s social media profiles. The apology did not go over well as many people felt that it was too corporate. It seemed like La Carnita was sorry for the caption and not for the misogyny it represented. @la_carnita Like, you didn’t just learn that it was offensive after people told you so. It was clickbait for bottom feeders. @la_carnita You needed a bunch of tweets before you realized that making fun of sexual assault was “an error”? Unbelievable. Jerks. As with the apology shared on Twitter, this post was also greeted with disappointment. One theme that became quite apparent today was that this is not La Carnita’s first time perpetuating this kind of frat-boy behaviour. Yes, that’s an image of a man peeking over a wall at a woman. On the door to the washroom. There were also references made to the usage of “tacHOES” by La Carnita on social media. A year ago a bunch of us got mad at La Carnita for tacHOES and the year before that for shaming girls in Uggs. Broken record on resto bros. Remember a few week’s ago when Skittles represented their brand with class? Clearly, the problems at La Carnita run deeper than just needing a good social media person. There is a serious culture problem when a business (restaurant or otherwise) thinks it’s okay to post anti-women messages on their social media. Will the sensitivity training help La Carnita? It’s hard to say. What’s great about Toronto is that there are plenty of great Mexican restaurants to choose from. Two that come to mind are Grand Electric and El Catrin.